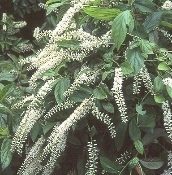 Itea virginica. Virginia Sweetspire. Native shrub attracting attention in every season. Vibrant maroon-red foliage in fall. Evergreen where winters are mild. Space plants 3-4 feet apart for hedge. Size Shipped: Gallon shrub. Height of plant you receive varies with availability. Henry's Garnet - up to 6 feet tall at maturity.